This entry was posted in Racing on February 27, 2012 by Steve Tilford. 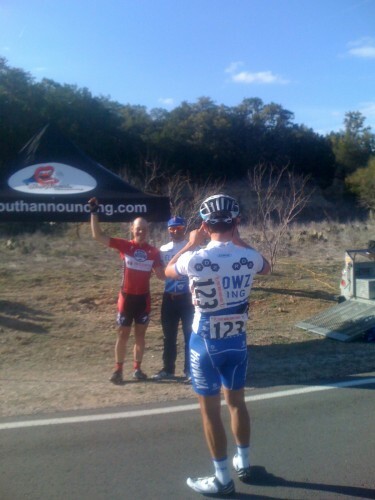 Yesterday’s race at Pace Bend was really interesting in a lot of respects. First of all, I have to give the Elbowz Team a big compliment. They rode a race that made the race respectable, without destroying and dominating the race. Well, they destroyed the field, but that was just from a strength stance. I have written here a bunch about how much I hate controlled bike racing. I still do. But, when a team has 10 riders in a race and there aren’t 60 riders in the race, and the 10 guys are at least as good or better than most everyone else in the race, then there is a big chance that the race will turn out to be stupid. That wasn’t the case. And that wasn’t the case because the Elbowz team realized that most likely it would be the case if they rode a free for all race, so they just practiced doing some stuff. In the end, it didn’t work out that well for them, but they know, and I know, and everyone else in the race should know that they could have won the race virtually every time they raced it against the same field. Okay, the race. The course was around 6 miles and we did 13 laps for a little over 80 miles. The course is rolling nearly the whole way, just a little bit of flat. The day was great, in the upper 60’s, maybe a little warmer towards the end. But it was pretty windy. Windy enough that it was super hard to be in a break. The upside of the course, from my perspective, was that there was nearly not a spot of true gutter riding. If that would have been the case, then the race would have been over for most of the field in the first 20 minutes. The race started off pretty aggressively, but nothing got established early. One and two guys would get away for maybe a lap or two, but then flounder in the wind. Eblowz was just letting the race happen, doing nearly nothing to control it. Finally, with maybe half the race left, 3 guys got away. Matt Ankeny, Colton Jarisch and Logan Hutchings were up the road. 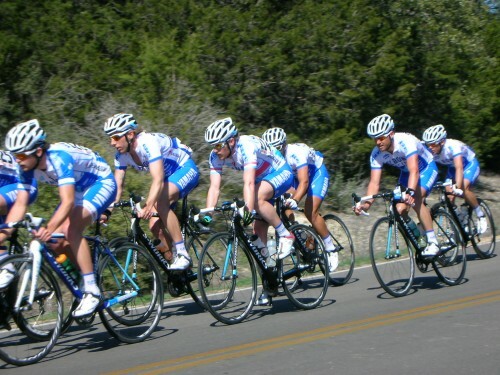 That is when the Elbowz team started riding at the front. And they never left the front until the last 50 meters. Fast forward to 2 or 3 laps to go when the break was only 20 seconds ahead and Brant Speed, 787, jumped out of the field and was instantly in the break. And the break disappeared up the road. I don’t know why Brandt Speed has never been on my radar screen, but the guy is super, super strong. He showed it in Walburg on Saturday chasing at 30 mph into a mild wind, but he really showed it yesterday. Matt came back and the break was over a minute ahead really quickly. The Elbowz guys made a mild error here and didn’t increase their pace early enough. I thought that they might have missed it completely, but they started rotating Joseph and Heath, 1st and 2nd from Saturday, and their pace increased dramatically. 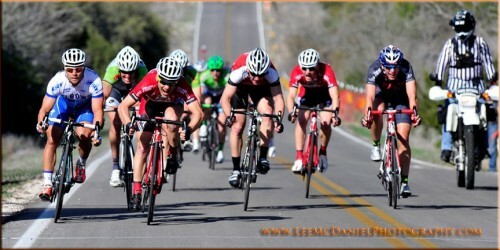 With 1/2 a lap to go, the break was within sight. And the field was at their limits. I was sitting just 3 or 4 guys behind the Elbowz guys and knew that the last time up the feed hill, about a mile from the finish, it would be carnage. And it was. Stefan Rothe, jumped at the base of the climb, right when Joseph was going for Elbowz. That wasn’t the brightest move. For either of them. Stefan was super strong and never should have went so early. And Elbowz didn’t have enough guys left to go from so far out. The last 1 km was wicked headwind. Joseph made it to about 1 km to go with only Heath Blackgrove left to lead out Eric Marcotte. That was never going to be enough. I was 6 or 7 guys back at the time. Josh Carter, Dogfish, blew and pulled out of line right in front of me and I had to make an effort to get up to Chad Cagle’s wheel, which was a good wheel to be on. The last 600 meters was mainly downhill, but into a headwind. Bill was on me until the last corner, but got chopped by a Squadra guy. Heath went from the corner and I don’t really know what happened at the very front because I was concentrating on staying on Chad. But for some reason, Eric got into the wind too early. Either Heath pulled off too early or Eric jumped too early. When Heath was coming back like a rock, Chad and Dave Wenger went around him and I didn’t expect it so quickly and got mixed up some. I left Chad and was coming up fast on the right, but Eric was coming back like a brick. I had to tap my brakes at 30 meters and couldn’t squeeze by. 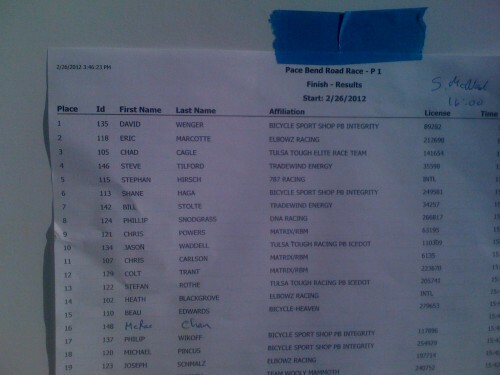 I ended up 4th, just a bike length + back. I was mildly disappointed, since it was a winnable sprint. If you would have told me nearly anytime during the race that I was going to end up 4th, I would of been more than good with it. Bill finished 7th, which was great also. There was a big split in the field behind us, so it was really only 7 guys sprinting for the win. So, yesterday when I told you that I had virtually no chance of winning the race, I would have also told you that I had virtually no chance to win in Pace Bend either. And that wasn’t the case. Bike racing is so interesting in that respect. The results are below. Dave Wenger won, which showed his 3rd place finish from the day before was good. He should feel pretty great about the win. He rode it super smart. But also, the race could have been won by any one of 5 or so Elbowz guys. They were pretty unbelievable all day. Today it is supposed to rain all afternoon. That isn’t good. I usually ride more on Monday after early season race weekends and then rest more on Tuesday. But, it is what it is. It is supposed to be in the 70’s all week. Hopefully, my tooth will feel better soon, it doesn’t yet, and I can get some miles in down here. Lago Vista is this weekend, which is an awesome course, but also the MTB race on Saturday is still in the back of my mind. It is good having choices. The front of the field the last half of the race. Jospeh taking a photo of Dave and Eric after the awards. 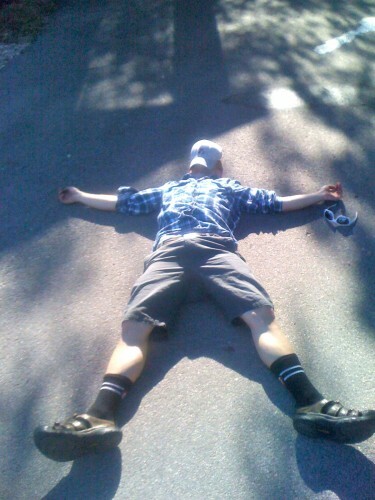 My team mate, young Ben Stover after the two days of racing.